This article originally featured on Lawfare and is republished with permission. It may be read in its original form here. As part of the September 2015 fanfare visit by Xi Xinping to the United States, the United States and China signed an arrangement on rules of behavior for safety of air-to-air encounters of military aircraft. The deal is supposed to avert aviation incidents in international airspace between military aircraft of the United States and China. In a deadly 2001 incident, for example, a Chinese F-8 fighter jet interceptor collided with a U.S. EP-3 aircraft that was operating more than 75 miles from Hainan Island, causing the loss of the Chinese aircraft and pilot, and an emergency landing in China by the U.S. surveillance aircraft. Similarly, in August 2014, a Chinese fighter jet roared over, under, and in front of a U.S. P-8 maritime patrol aircraft – coming as close as 50 feet to the American aircraft – about 135 miles east of Hainan Island. The Chinese jet climbed vertically with its underbelly showing in front of the U.S. aircraft to display its under wing combat load out. After China’s establishment of an Air Defense Identification Zone (ADIZ) in the East China Sea in 2013, Beijing appears poised to adopt a similar zone over the South China Sea. Over the past 18 months, China has constructed three airstrips on artificial islands in the Spratlys that are capable of handling the country’s most advanced military aircraft. China has also deployed surface-to-air missiles to Woody Island in the Paracels and has installed high-frequency radar systems on four of the reefs that it occupies in the Spratlys, which significantly enhances the ability of the People’s Liberation Army (PLA) to monitor surface and air traffic in and over the South China Sea. The new “Rules of Behavior for Safety of Air-to-Air Encounters” (Air Rules) is not a legally binding instrument, so it does not create any new substantive obligations. The agreement also does not create any new norms, as customary international law already requires military aircraft to fly in accordance with the rules applicable to civilian aircraft “to the extent practicable,” and to exercise due regard during air-to-air encounters. China wanted (and obtained) the deal as a trophy of great power status and strategic equivalence. The Air Rules are likely to be a fruitless exercise to bring China back into compliance with international norms and its preexisting legal obligations. But if the deal merely restates existing obligations then what is the harm? We view the new Air Rules as more than just a superfluous agreement. The Air Rules reflect orthodox liberal internationalism and the belief among many U.S. international lawyers and policy makers that the international system is made safer and more stable and secure by enmeshing states in a continually expanding web of new commitments. Often, as is the case with the Air Rules, the specific terms of an instrument, the fact that an agreement does not reflect an actual meeting of the minds, or a lack of compliance with its provisions, are deemed less important than the good vibes hopefully generated by signing something. But the Air Rules erode confidence in international law as an effective element of diplomacy and security and diminishes more authoritative sources of law by adding an additional layer of ambiguity and confusion. Moreover, a bilateral deal plays into China’s claim that the issues concerning air-to-air interactions between Chinese fighter jets and the slow and vulnerable American wide body aircraft involve good faith differences over the law between Washington and Beijing, rather than China unilaterally breaking with universal norms to drive U.S. surveillance from the region. The arrangement states that the parties “should” operate consistent with the 1944 Convention on International Civil Aviation (Chicago Convention) and its Annexes and guidance….” Yet the Chicago Convention is legally binding; the Air Rules fail to state that the United States and China “shall” comply with its terms in accordance with their legal commitments. The Chicago Convention reflects the norm of customary international law that aircraft will fly with “due regard” for the safety of other aircraft, so the United States and China are already bound to observe this norm as a matter of law. The requirement in the Annex that the parties “should” operate consistent with the Chicago Convention dilutes the existing legal duty. This section of Annex III should have stated that the parties “shall operate” consistent with the Chicago Convention; it does not and international law has been weakened. The arrangement says that the two powers are to “encourage” active communications during air-to-air encounters, but then states the opposite by specifically indicating that there is no obligation to communicate during such events. The arrangement requires the two states to maintain safe separation of aerial forces using their own “national rules,” although China’s national rules are incompatible with its own treaty obligations in international law. Referencing China’s unlawful national rules in the Air Rules lends them undeserved credibility that undermines the rule of law in the airspace over the oceans. Furthermore, while the arrangement states that an intercepting aircraft should maintain a “safe separation” with other aircraft, it also says that the “intercepted” aircraft should “avoid reckless maneuvers.” This language clearly recalls the 2001 EP-3 incident described above, in which the Chinese side accused the slower and larger, multi-engine EP-3 aircraft of intentionally turning into the F-8 interceptor. This incredulous claim and the reference in the Air Rules for intercepted aircraft to avoid reckless maneuvers helps China avoid responsibility for past aggressive interceptions. Future scenarios are likely to raise similar facts – Chinese fighter jets intercepting slower U.S. reconnaissance aircraft. The text that attempts to balance or equate responsibilities for avoiding air-to-air incidents implicitly supports China’s effort to avoid responsibility for such incidents. The arrangement considers establishment of warning areas or danger areas using the worldwide Notice to Mariners (NOTAM) system. This provision is also an existing legal requirement and therefore superfluous. China currently does not comply with this legally binding requirement, so why would it now comply with a new, nonbinding requirement to do the same thing? The arrangement states both sides should implement “in good faith” the 2014 Code for Unalerted Encounters at Sea (CUES). This “good faith” requirement is notoriously ambiguous in international law, and in practical terms is not an obligation to do anything. Furthermore, China already has signed CUES, so it already has a preexisting duty to implement it in good faith regardless of what is included in the new Air Rules. Rather than focus on getting China to comply with the nonbinding CUES, it would be better to insist that China fulfill its binding and longstanding legal commitments. The arrangement indicates that aircraft are entitled to freedom of navigation and overflight in warning areas, but this provision is already a legally binding obligation that China ignores. Will the new, nonbinding Air Rules encourage compliance? Furthermore, China has long insisted that the right of freedom of navigation and overflight is limited to non-military ships and aircraft, or is subject to coastal state requirements, such as prior notification or consent. Finally, the arrangement states that aircraft “should” avoid certain actions that may be seen as provocative, much like the Incidents at Sea Agreement (INCSEA) between the superpowers during the Cold War. Once again, however, this legally nonbinding provision is already subsumed by the legal requirement to exercise due regard during air-to-air encounters. China’s dangerous interception of U.S. aircraft in international airspace violates long-standing and legally binding rules and norms of international law, so adding a new layer of nonbinding provisions merely creates unhelpful ambiguity and dilutes China’s preexisting legal obligations. Since lawyers are experts in the craft of statutory interpretation, saying the same thing in a different way can actually weaken rather than strengthen the underlying norm because it adds additional grist to the interpretative mill. Besides the political significance of the agreement, the Air Rules are a new plank in China’s unremitting campaign of lawfare. The Air Rules either fail to invoke the appropriate legal terms of art or contain counterproductive and unorthodox references designed to place the United States in a worse light and provide China with colorable arguments to justify its unlawful behavior in the aftermath of the next air-to-air encounter. The superfluous nature of the arrangement is also not helpful to the United States. There is a view among liberal internationalists that mention of preexisting international obligations in new agreements helps to reinforce them, and this approach perpetuates a compliance spiral that brings states closer together. But China already understands its existing legal obligations and chooses not to comply, so repeating them in oblique terms in a non-binding agreement only serves to weaken the very terms the United States seeks to reinforce. Raul “Pete” Pedrozo is Deputy General Counsel for the Defense POW/MIA Accounting Agency (DPAA). Previously he was a Professor of International Law in the Stockton Center for the Study of International Law at the U.S. Naval War College, where he now serves as a Non-Resident Scholar. A long narrative on unenforceable air regulations. 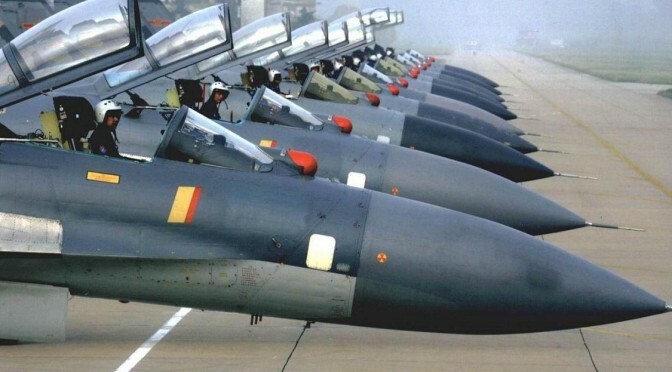 This, to me, merely shows that Chinese military pilots simply lack the professionalism and true skills of Western pilots. They (and Russian pilots) consider themselves as “cowboys”, free to fly like teenagers with a computer Flight Simulator. Russian pilots show that they have pretty fair flying skills, but still like to toy around when flying, imagining themselves as the “Ace of the Base”. These are MY opinions as I see them. I’m sure that others will defend them. Does a long ago CIVIL aviation rules[1944 Convention on International Civil Aviation (Chicago Convention) ] apply for military aviation? Usually these ICAO type rules are very flexible anyway as many countries opt out of various parts when it doesnt suit their national interests. Same goes for UN law of the Sea [UNLOS], the US never even signed that but says they will observe it ( but not be bound by anyone who uses it against them, ie possession of far flung atolls or sea bed ocean boundaries). Australia has signed it but opted out when their ocean sea floor grab was questioned it its small neighbour Timor.